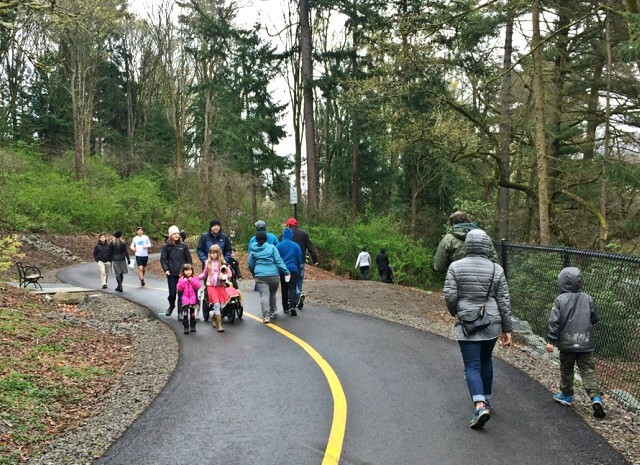 An estimated crowd of between 800 and 1000 visitors came to the Arboretum on Sunday, April 8 to celebrate the Grand Opening of the Loop Trail. The weather was typical for April in Seattle, veering from windy and wet to cloudy and not-so-wet, but that didn’t dampen the party spirit! Visitors enjoyed a fun afternoon of music, food, and community activities. 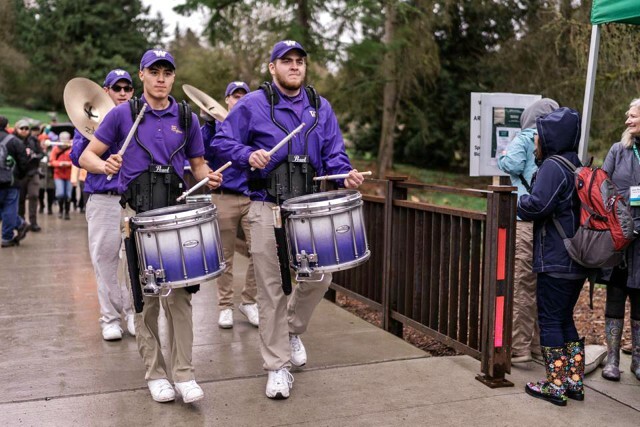 Members of the Husky Drumline performed at the beginning and end of the main ceremony at the Birch Parking Lot (video clip on Facebook), adjacent the trail—and they were a big hit! Nearby, Gansango entertained visitors with some amazing drumming of their own (video clip on Facebook) and led a short demonstration in West African dance. Seattle’s Child hosted a wheel-decoration station and helped younger visitors embellish their bikes and trikes. UW Director of Regional and Community Relations Sally Clark emceed the ceremony with her signature wit and aplomb. Seattle Deputy Mayor Mike Fong led off the guest speakers by highlighting the vital contribution of the Washington State Department of Transportation’s 520 Program to the creation of the new trail. 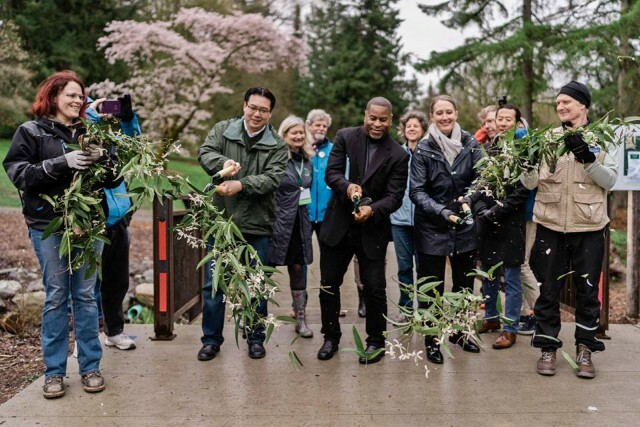 Dan Brown, director of the UW’s School of Environmental and Forest Sciences, spoke about how the trail makes the Arboretum’s world-class plant collection more accessible to the public and creates new opportunities for education. Interim Director of Seattle Parks and Recreation Christopher Williams thanked the project designer (Berger Partnership), builder (Ohno Construction), and manager (Garrett Farrell, Seattle Parks) for their stellar work on the trail, and he spoke about how the trail fits with the Parks Department’s vision of “access for all.” The final speaker, Board President of the Arboretum Foundation Sherrey Luetjen, talked about how the trail will help build a more diverse community of Arboretum users, members, and advocates. Visitors then dispersed throughout the Arboretum, walking and biking the new two-mile loop trail. Along the way, they enjoyed food trucks and free snacks, and a variety of performances and experiences, including New Orleans jazz at the Pacific Connections meadow, a book signing at the Visitors Center with outdoors writer Craig Romano, and educational activities hosted by UW Botanic Gardens. Thanks to everyone who came, to all our great performers, volunteers, and participants, and our event sponsors! If you haven’t seen the trail yet, pay a visit to the Arboretum to experience a great new venue for recreation in our city! MORE PHOTOS: See lots more event photos on our Facebook page.